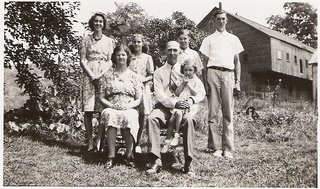 The Smeltz family with Shirley on her father's knee. 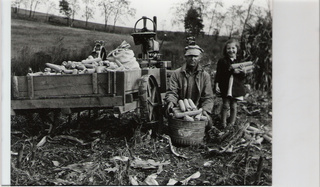 Shirley husking corn with her dad. The 1940s and 1950s were slower times, especially if you lived on a central Pennsylvania farm. I look back on those years of my childhood with fond memories. Through the pages of this book, I hope to give you a glimpse of what life was like for me, a gangly shy farm girl whose life centered around family, faith and friends. Part of a community of folks known as the Pennsylvania Dutch, we took pride in the work of our hands. Whether it was an embroidered pillowcase, a dusted living room or ironed overalls, we wanted to do the job right. Our parents gave us the proverbial roots and wings. They taught us to live godly lives based on godly principles. They taught us to look for the best in people and circumstances. Then they set us free to make our own decisions and live our own lives. The persons, places and things I encountered along the highway of life had much to do with shaping me into who I am today, and I am grateful to many people. My immediate family consisted of seven people. My father, Daniel Monroe Smeltz, married my mother, Grace Estelle Huntzinger, on November 15, 1924. Their children were Robert Calvin, Ruth Esther (Beissel), Russell Alvin, Marie Eleanor (Phillips) and me, Shirley Grace (Brosius). We lived near the northern border of Dauphin County, about a mile back in the country from Route 25, which ran between Spring Glen and Gratz. How I’ve lived my life has much to do with the “messages” I received from my family and others during my childhood. I pray that the values I learned will guard your hearts and bless your lives as well. The Message, Then: Parades make people cry. Memorial Day parades made my father choke up. I wondered what was so moving. But later in life I read his diary of World War I. Then I knew. On November 11, 1918, he wrote, "The biggest day of my life. Eight a.m. runner reports that armistice is signed to cease firing at 11 a.m. There is heavy firing all through the morning, and we do not know what to think about it. We anxiously await eleven o'clock. After a few mighty bangs and roars, all is quiet. The war is over." Dad, a member of Company A, 34th Infantry, 7th Division, sailed for Europe on the "America" on August 17, 1918. Ten days later he landed in Brest, France, and soon headed to the Front. He wrote of 7- and 12-mile hikes. At St. Etienny, he bathed in the Moselle River and came down with a sore throat and fever. Too ill to march when his company moved to Averainville, he rode on top of an open supply wagon—in rain. Later he slept on a stone pile—in rain. On November 1 he carried ammunition, barbed wire, picks, shovels and grenades to Front lines and returned under the fire of German machine guns. A second trip resulted in a "close shave" when Germans started firing "one pounders." My Response, Now: How might I express my appreciation to veterans for their sacrifices? The Message, Then: Do not point fingers. When the Finks' pickup truck rattled up the lane, you knew they were looking for scrap metal. They paid my father a few cents per pound for junk that always seemed to accumulate around the barn. Their children went to school with us, and we considered the Finks to be even poorer than we were. They were quiet people and never caused any trouble. One summer day we discovered a garden hose was missing. We looked for it in the summer shanty, in the barn, by spigots, all the usual places it might be, to no avail. Someone finally suggested that the Finks might have taken it. As time went by and the hose didn't turn up, we assumed the worst. We never questioned the Finks, but we kept them under close scrutiny when they again visited. The following summer, to our chagrin, someone found the missing hose, lying in tall grass, where it had been stretched to fill a cattle trough. From then on, whenever something was missing, we would say with a chuckle, "The Finks must have taken it." And the missing object usually turned up sooner or later. My Response, Now: How might I show greater respect for others? The Message, Then: Church is a holy place. Church seemed to me a mix of holy and unholy moments. Holy moments were when we read in unison a confession for the forgiveness of sins, when we awkwardly squeezed between the pews to kneel during Holy Communion services and when the sun shone through our stained-glass windows. Unholy moments came when my friend Dolores and I giggled over an errant fly on some lady's hat, when the preacher droned on in theological terms or when the hands of the clock froze on hot summer days. At such times we fanned ourselves with cardboard fans on sticks, showing scenes of Jesus' life and imprinted with the name of a funeral home. Through it all my soul was gently cultivated and irrigated. This was my church and these people formed my community of faith. Even though I observed them in weak moments—gossiping, backsliding, sniping—I respected the God to whom they vowed allegiance and joined them in their quest to know Him better. My cousin Harry taught our teen Sunday school class and in his slow drawl explained his ring imprinted with the letters IHS. I didn't grasp his explanation of the Latin words to which the letters referred; but I did grasp his faith in Christ, and he whetted my appetite to know the Savior. My Response, Now: How might I better appreciate holy moments? The Message, Then: Education is a high privilege. Sometimes dogs or even turkeys chased my siblings as they walked a mile to school over a dirt country road. On occasion, they ran back home and Daddy delivered them in his Model A Ford. He was the school "enumerator" or truant officer, so no one in our family played hooky. Each school day began with Bible reading, the Lord's prayer, and a salute to the flag. Grade by grade students were called to the front of the room for teaching while others worked on assignments. Students learned as they listened in on older classes. My sister Marie skipped a grade, a fairly common practice. Students fetched water from a home a quarter-mile from the school by carrying a pail on a pole between them. The water was stored in a crock-like cooler with a spigot. Each student had his or her own cup. My brother Russell once had to write "The bell is my boss" 500 times for being tardy. My sister Ruth memorized "The Charge of the Light Brigade" for an infraction. They considered it an honor to clap erasers on Fridays. By the time I was six, my siblings were attending high school, so my parents sent me with them by bus and paid $20 a year tuition for me to attend the Hubley School District with a typical elementary school. My Response, Now: Am I taking advantage of educational opportunities before me, including those of my church? The Message, Then: Work is fun and working together gets the job done. On fall mornings, before the sun got too high, my dad cranked up the John Deere tractor, lifted me onto a wagon behind it and off we went to the cornfield for a few hours of husking corn. I usually wore long stockings held above my knees with elastic bands and an outgrown Sunday coat over my play dress to ward off autumn chill. I loved "helping" my daddy. Breathing in the musky smell of damp corn stalks, I slipped the leather strap of a corn husker onto my hand, used the pointed metal end to break through the husk, then pulled. The hardest part was breaking the husk from the cob once it was stripped back from the ear, but I did my best. After an hour or two, I got blisters on my hands and took a play break. Daddy shoveled the ears into the corncrib, a corner of the barn with wire walls that allowed air to circulate and harden the kernels. During winter months, I'd feed the ears into a corn sheller, cranked by my dad. It was then taken to the mill to be ground into feed. The ears with a few remaining kernels were thrown to the pigs to be finished off. My Response, Now: How am I helping to get the job done? The Message, Then: Group projects are fun. Tongues stitched conversation as quickly as needles stitched fabric when neighborhood women gathered in a home to quilt. Isolated farmwomen jumped at a chance to socialize. A hostess might serve mint tea or coffee and cookies, but the evening was reserved for quilting. I'd play under the quilt top just to listen in. Quilts were placed on a frame in a spare room with a chair or two along each of four sides. Needles were threaded with a single strand, knotted at the end. On the initial stitch, the tiny knot was yanked beneath the quilt top so it remained hidden in the cotton batting. Then the quilter moved the needle up and down, through the top, batting, bottom of the quilt and back up, catching several stitches before pulling the thread through. Tiny even stitches were the envy. Mother pieced together colorful quilt tops—wedding ring, Sunflower Sue, nine patch—on her black treadle sewing machine. She penciled quilting designs onto quilt tops using a yardstick and one of her scroll patterns. Quilts were not just for "show." They were spread on beds, laundered and hung out to dry. Once a quilt faded and developed holes, we spread it on the lawn beneath our pear trees to lie upon on steamy summer afternoons. My Response, Now: To what group project might I lend support? To order Persons, Places and Things click on the "Contact the Author" button and send your mailing address. An invoice will be enclosed with the book. Cost, $15, which includes tax and shipping.